At Longmont Complete Dentistry, many of our patients are dog lovers, so when we ran across this story this past July, we knew we had to share it on our blog. Apparently, hairless dogs are not only unique because of their one-of-a-kind “naked” look, but also because of how their teeth are formed. Nature is so weird and interesting all at the same time, right? Scientists at the Max Planck Institute and the Fredrich Schiller Universität Jena wanted to understand more about this particular dental phenomenon, so they studied over 100 skulls of pedigreed hairless dogs. What they found not only helps the world at large better understand dogs, but also how the teeth develop in mammals (like us!) as well. Read on to learn more about this story from your dentist in Longmont. 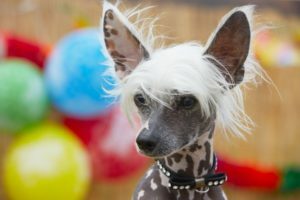 The missing hair found in breeds such as the Chinese Crested Dog and the Mexican hairless dog is actually the result of a mutation on one of their genes, specifically one called the forkhead I3 gene (FOXI3), which happens to also be involved in the development of the teeth. After studying numerous skulls of hairless dogs, researchers found that they are usually missing their replacement teeth (i.e. incisors, canines, and premolars). What was also remarkable was that the deciduous premolars (as in premolars that naturally fall out) and the permanent molars were found to be a much different shape compared to those in normally coated dogs as well. Using DNA samples, scientists were able to demonstrate that these mutations were directly associated with the FOXI3 gene variation that also causes hairlessness. This is actually not the first time that science has noticed this trend among hairless dogs. An experiment conducted in the early 20th century that consisted of crossbreeding hairless and coated dogs also led to this partially lacking dentition. What’s especially interesting is that these types of teeth alterations can also be found in other mammals such as the great apes and even humans. With this in mind, the researchers now suggest that the FOXI3 gene may be of general importance to the development of teeth in all mammals and not just dogs. For now, not too much! While science is gaining a much deeper understanding of how genes influence the development of animals, it is not quite at the point where scientists can actually do anything to influence them. What this will do for now is potentially provide answers for those people whose teeth do not develop normally. This is all tremendously interesting stuff, and in the next decade or so, it’s likely to have a direct impact on human beings and dental care in general. Be sure to keep up with our blog for more fascinating dental stories in the future!